With the first sprinkling of snow dusting the ground it was time to get out for a spot of weekend camping and the first camp of 2017. Since we launched the Arctic Overland Film Series our feet haven’t touched the ground and although being flat out is a good thing we are solidly keeping things in check and focused on why we do this. Dan turned around at work and announced out of the blue that he had booked us onto WoWo campsite for a night so we could get away from CVC HQ and out in the great outdoors. We packed the vans, filled up with food, drinks and fire wood and headed off. Although WoWo campsite may not be the kind of place that we would head to in the summer months it is a perfect stop over in the winter when you pretty much have the entire place to yourself. It gets really full in the warmer months and probably for good reason as it is an amazing venue but ‘Glamping’ isn’t really our thing so are more than happy to pitch up in the colder time of year. The cold weather isn’t so much of a problem and van camping doesn’t have to be just a summer pursuit if you get equipped with our Deluxe thermal window mat set here and pop top thermal wrap here. The two vans headed their separate ways on Saturday but we met up again on the Sunday at Shoreham Airport for the RollingSlow (VW T25ers around Brighton area) meet. What a nice bunch of people they were. First Weekend Trip Out of 2017 WoWo & Rolling Slow from CampervanCulture.com on Vimeo. 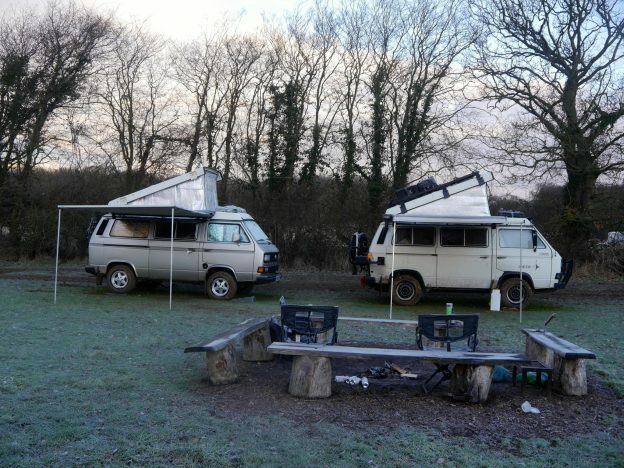 This entry was posted in campervanculture.com, Short Trips Around The UK on January 16, 2017 by jed@CampervanCulture.